Let us launch ourselves out on new seas of challenges–brave and bold and each ready to conquer to his own ideal of satisfaction and success. 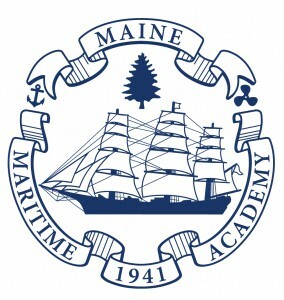 Founded originally as a nautical training institute to contribute skilled mariners for the war effort in the 1940s, Maine Maritime Academy now offers 18 degree options. The college has changed in many ways over the last 75 years. But, some of the traditions–the things that have remained the same–make us unique. Over the years, traditions have honored and carried on the legacy of the first “middies” to graduate from the Academy. The Academy seal is a mark that has been synonymous with the college since its founding days. The original seal adorned the first school sign located at the Pentagoet Inn and can be found stamped into the cover of the yearbook of the first graduating class of MMA, 1943-1. Although small changes have been made to the seal over the years, the symbols and the meanings behind them remain the same. Illustrations of an anchor (originally a sextant) and propeller represent the first major areas of study at the Academy: Marine Transportation (Deck) and Marine Engineering (Engine) respectively. The pine tree is representative of the flag and motto of the State of Maine, Dīrigō (Latin), meaning “I Lead.” The sailing vessel in the center is positioned as a privileged vessel on a starboard tack. In the 1980s, the sailing direction was reversed, but was revised back to its original position as of the 75th anniversary as a demonstration of respect for the alumni of our early classes and for the honor and tradition that is the foundation of Maine Maritime Academy. The MMA March was written by Albert B. Bennett Jr. ’54 who gifted it to the Academy. It was played officially for the first time in MMA history at the Homecoming March On before the 43rd Admiral’s Cup football game on Saturday, September 19, 2015. Bennett and his wife, Jane, were present to hear it. His gift to MMA is a lasting musical tradition for generations to come; his love of music is carried on through the regimental band at Maine Maritime Academy. The MMA March is intended as a spirited fight song, to get people on their feet and provide a chance to shout for Maine Maritime Academy and cheer for their Mariner Sports teams. The action words SHOUT and RAH! RAH! can be emphasized with a closed fist pump, and for the words, “take off your hats and raise a cheer,” hats can be can raised. Each fall, first-year students gather at the stern of the ship for an official “jump” into their life as a Mariner. The group, having been through training, literally jumps off the ship. This tradition began in 1960 when the academic program expanded from 3 to 4 years and has become a right of passage for each new Mariner. 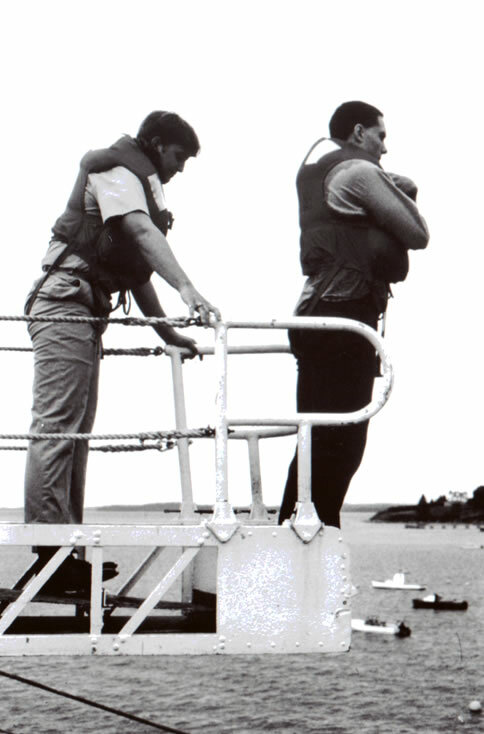 It is a bonding experience, a confidence booster, and a preparatory requirement for safety at sea. 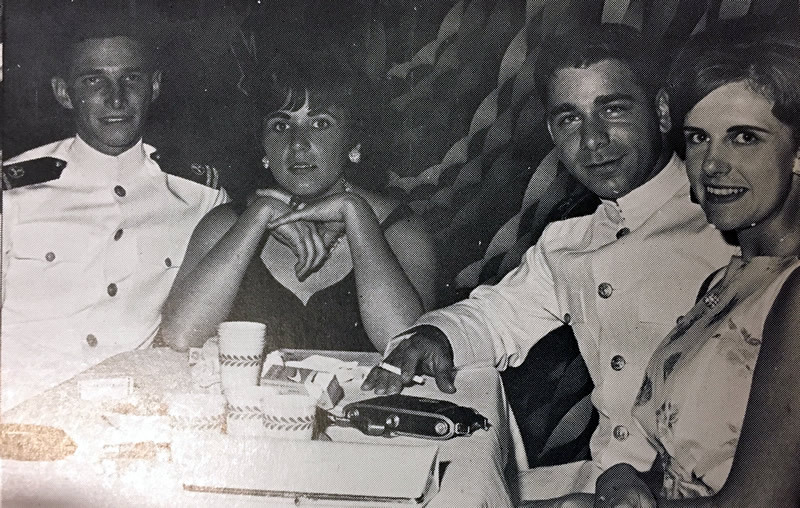 With the absence of a graduating class in the Spring of 1963, it was decided by the junior class officers to initiate a new tradition: Junior Ring Dance. This tradition lives on at Maine Maritime Academy today. At the end of each academic year, the junior class, having received their class rings, attend a ceremony and dance honoring the rich history of the MMA class ring. During the ceremony the history of the class ring is explained and each junior comes forward to have her/his ring washed in sea water. Ring Dance is sponsored by the junior class who begin raising money for the event during the fall of their freshman year.